What is included in the CPCA? The CPCA offers several useful assessments and inventories to the prospective lead church planter, church plant team members, and their planting organizations. The CPCA is intended as an initial indicator of a potential planter's readiness for church planting. The following tools in the CPCA are designed to provide a strong assessment process start for church planters, their team members, sponsor churches, and the church planting organizations. Potential planters will have access to their completed reports immediately upon completing each one of the items. Registered organizations receive copies of the reports via email. The Church Planter Candidate Assessment Tool (CPCA) is the online assessment instrument developed from this research. CPCA works to help you identify areas of strengths and needed development as you work with your partner organization and others in the potential church plant. Experienced church planters will tell you that the more you understand about yourself before you plant (strengths and weaknesses), the better prepared you can be for the challenges ahead. It covers 22 areas identified as important to successful church planting. The Spiritual Gifts Survey is a basic tool to help you think about the areas of ministry and service in the local church where you may be more comfortable serving than others. When answering these, consider who you are as a member of the church rather than as a staff member of a church. I like to use this definition: A spiritual gift is an expression of the Holy Spirit in the life of believers which empowers them to serve the body of Christ, the church. Romans 12:6-8; 1 Corinthians 12:8-10, 28-30; Ephesians 4:11; and 1 Peter 4:9-11 contain representative lists of gifts and roles God has given to the church. According to Tom Nebel, Director of Church Planting for Converge Worldwide and creator of the Risk Factor Analysis, "church planting is risky business, but experience shows that when a qualified church planter is fitted with the right environmental situation the likelihood of sucess is greatly enhanced." This short questionnaire helps bring clarity to how much risk the potential planter is taking on and opportunities to lessen that risk before beginning the church plant. The Risk Factor Analsis is the one tool that can be retaken after 3 months to see if specific steps taken by the planter have potentially lowered unnecessary risks. The Ministry Systems Experience is a simple tool to help organizations understand a current or potential church planter's previous experience. We suggest that this will be best used as an ongoing coaching and team building tool. We built this to help you understand the practical, "nuts and bolts" experiences someone has in the key systems found in many church plants. Of course, methods and models vary, so this should just be used as a guide. Transformational Discipleship is a journey that progresses differently for each follower of Jesus Christ. Knowing where you are at in terms of your spiritual formation is the first step toward taking proactive steps in your discipleship. The TDA is an online assessment tool that helps individuals and churches assesss spiritual strengths and weaknesses. It can be purchased at the Transformational Discipleship Assessment site ($9.95 for an individual and bulk rates available for groups and churches), but is included at no extra cost in the Church Planter Candidate Assessment tool. The CPCA 360 Assessment is an opportunity for the potential church planter to invite six people to provide feedback about the planter to a church planting organization. When applicable, a church planting candidate may also invite a spouse (or fiance) to complete a 360 assessment. 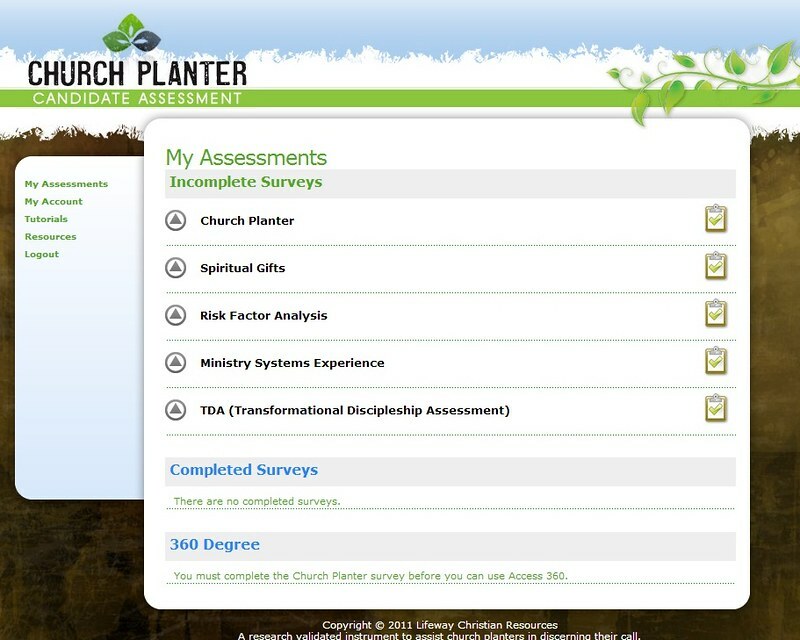 The CPCA 360 is built around the initial church planter assessment (first item listed above) but asked in the third person ABOUT the planter. Results are provided ONLY to church planting organizations, not to individuals. We cannot provide CPCA 360 Assessment results for individuals that are not affiliated with one of these organizations. Because of the spiritual nature of the questions, even the professional contacts that are invited should know the planter very well. 2 POM – Professionals outside of ministry (not in vocational ministry) These should be individuals who have had frequent professional interactions with you. (Example: Sales professional, manager, plumber, shop foreman, lawyer, office manager, etc. The responses of the 6 contacts will be averaged and provided on a report to the organization. The goal is not to see how "high" a planter's score is but how closely their responses are to the six references. You will provide their name, title, email address, which of the 3 categories they fit into, phone number, approximate number of years you have known them, a personal message, and the language the survey should be in. After purchasing the passcode, and clicking the "activate membership link" in your order summary, our team can help with any challenges you might have registering the passcode. You can check out the helpful links page or email us at churchplanting@LifeWay.com.